Students from room 7, room 8, room 9 and room 12 have been learning to use online coding games to problem solve, persevere, learn left/right, forwards/backwards and up/down commands to complete levels on coding games. 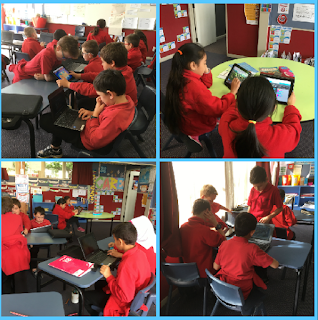 We accessed online coding games from: https://hourofcode.com/nz/learn or some students managed to work through some levels on: http://lol.disney.com/big-hero-6-code-baymaxSome students found the commands difficult to work out and more experienced students helped them through the process, tuakana teina which is an integral part of traditional Māori society, provides a model for buddy systems. An older or more expert tuakana (brother, sister or cousin) helps and guides a younger or less expert teina (originally a younger sibling or cousin of the same gender).